Because of the big price tag for most small business marketing budgets, the are often the first expense to be cut when times are tough . But, without marketing, sales suffer, and the cycle continues. Joint venture opportunities are an option to keep your dreams alive even in tough times. The definition of joint venture is a calculated partnership between a number of business owners to share resources toward a common business goal. In English, this means that small business owners have the opportunity to contribute toward a goal that everyone will benefit from. A joint venture can be as simple as working with another business owner to cross promote your products, or as complicated as collaborating together on an elaborate weekend event. 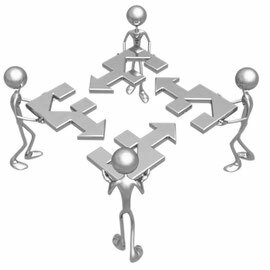 Anyone involved in a joint venture will benefit regardless of the complexity. First, is your chance to create more power from your marketing budget. When you are not footing the entire bill, you might be able to afford advertising on radio or TV where in the past you were limited to print. And every member of the joint venture has contacts and customers that can benefit the other members, expanding everyone’s sales force. New business owners really benefit from choosing the right strategic business partners because they can establish their credibility very rapidly. People perceive you to be like those folks you associate with, so if you are wise choosing your joint venture partners your reputation will grow rapidly. And, those folks are successful for a reason – so if you take advantage of their knowledge your learning curve will be greatly reduced. But the biggest advantage of joint venture marketing is that you can keep your dreams alive through collaboration. No goal is out of reach once you have found the right partners to make it happen. Small businesses are thriving through joint venture marketing, even during these tough economic times. Yours will too when you seek out the ideal joint venture partners to meet your objectives.